It's not often I see something in Target's furniture section that jumps out at me. Luckily I was informed by a friend of mine the other day about the Too collection by Blu Dot for Target. I think this collection is really quite brilliant; perfect for young hip couples living in big cities or suburbs. The collection is quite witty and the colors are fun. 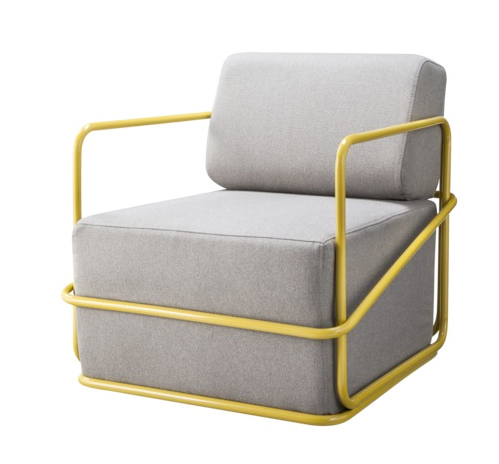 One of my favorite piece from the collection is the Sig Lounge Chair ($299.99). It has a great industrial look that I think will look perfect in a loft setting. It looks quite comfy too. Unfortunately it is only available online. In fact, looks like just about the whole collection is only available online. That's too bad because it's hard to judge a piece of furniture's fabric color and texture as well as the size and proportion solely from the pictures provided by Target. Let's just say if I order this chair and for some reason I don't like it. It's a huge hassle to wrap up the chair and send it back. Personally I think Target should sell the whole collection in store. Anyway, if you want to take a chance on this fun lounge chair, you can find it here.